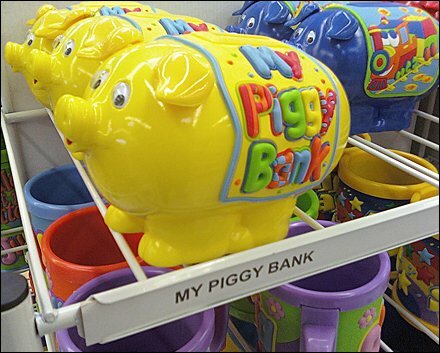 Saying “My Piggy Bank” in C-Channel at shelf edge for a coin bank that itself says “My Piggy Bank” seems a bit redundant. How about a motivational message like “Teach Kids to Save” or “Good Habits Are Best Learned Early?” … or better yet “First Dollar Savings Given at Cash Register?” I doubt whether this is planogram instructions at the shelf edge, but who can tell. What sales-motivating message would you place here?